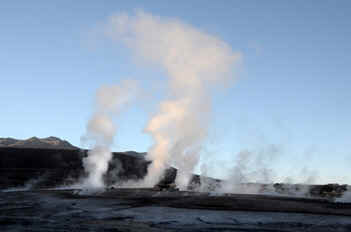 Two views at dawn in the Tatio Geysers, Chile. 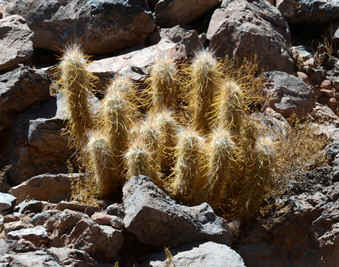 This winter I was lucky enough to go on a conducted tour of cactus locations in Argentina and Chile. 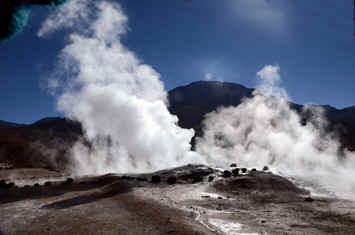 When the trip was in the early stages of booking and preparation it was suggested that we might visit the Tatio Geysers. 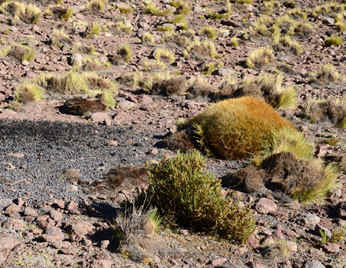 These are a geothermal field with fumaroles, (or steam vents, but I like the expression fumerholes!). The tour organiser indicated there was no problem and an extra day was allocated for this outing. Travelling from Argentina we overnighted at San Pedro de Atacama, just in Chile. The best time to see these geysers is against the sunrise, (they say). It is a two hour drive to the geysers, so at 5.00am we caught the tour bus. We had been warned to expect temperatures of -10ºC but in the event it was warm – only -3ºC. I now knew why I had packed that fleece jacket. I needed it! 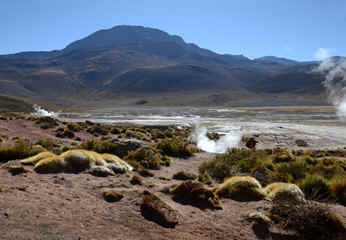 The Tatio Geysers are reputed to be the third best in the world. I have visited the best at Yellowstone twice and this Chilean version is nowhere near as spectacular. (I don’t expect I will be visiting the alleged second best – they are on the Kamchatka Peninsula in Russia.) But you would hate to drive past without looking. There is a certain kind of magic as the rising sun caught the steam contrasting with the snow capped mountains. The tourists turned their cameras everywhere to capture the moment. A whir of digital pixels. Then some of them, (not us, we are cactus tourists), took off their clothes to bathe in the hot springs. We ate a picnic breakfast, milk for our coffee or hot chocolate heated in the hot spring that fed the bathing pool. Tiring of all that steam the group wandered up the grassy slopes. CACTI! 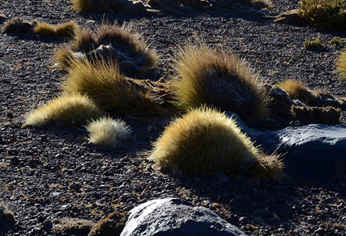 Disguised as clumps of grass, unless you looked against the rising sun, was a cactus. A mound of yellow glassy spines that the cognoscenti soon diagnosed as ‘ignescens’. You notice I have not indicated a genus because the cognoscenti argue about these things. Let’s just say that the consensus might be Cumulopuntia boliviana subsp. ignescens. Or not. Anyway here was a high altitude (4300m) ‘alpine’ cactus well adapted to its environment. The altitude is even more impressive in feet; 14,107 feet! The cactus was dome shaped to resist desiccation and damage from high ultraviolet light. Also fiercely spiny to resist being eaten by the vicuña, which are the local members of the camel family we saw in this area. The camel family? Yes there are four species around here, the others are llamas, alpacas and guanacos. Having found many cacti we had to find the biggest. And then we queued to have our picture taken with it. Meanwhile vicuña, (is the plural vicuñas? ), laughed at the stupid gringo tourists who had fallen in love with a plant that was no good to man or beast. Right: Remember you read this here! Vicuña always pooh in the same place and this Cumulopuntia was well manured. 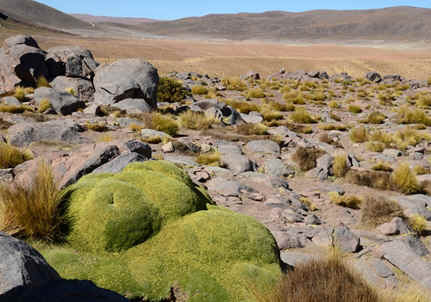 The Atacama vegetable sheep, Azorella compacta. On the return drive we stopped to see ducks and coots nesting on a lake (just like at home) and our driver Williams showed us ‘llareta’, (sometimes spelt ‘yareta’, as it is said). I had christened this curious plant a ‘scabweed’ when I saw it in Argentina, because similar looking plants in New Zealand have this local name. The habit is to form a mat, then later a mound. Then they are also called vegetable sheep in both New Zealand and Chile. All are very slow growing. The New Zealand ‘scabweeds’ and ‘vegetable sheep’ are members of the Asteraceae or Daisy Family. The Chilean/Argentinian look-a-likes are from the Umbelliferae family. (Or these days the Apiaceae.) So, an unusual relative of the carrot. 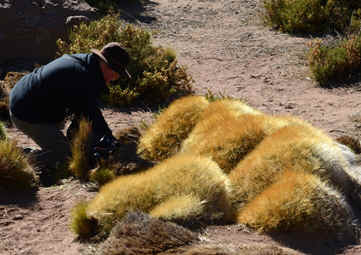 Azorella compacta was apparently locally threatened in Chile by miners who burnt dead plants for fuel. Soon they kicked live plants out so they would kill them. It was not clear whether the plant was saved by conservation measures or the closing of the mines. However it was common across the border in Argentina where I saw the same species in flower with minute white blooms held close to the foliage. It is in cultivation in the UK by alpine enthusiasts. Williams, our driver had promised us ‘cardóns’, known to us as Echinopsis (or Trichocereus) atacamensis and we were not disappointed. 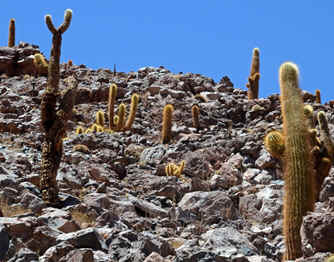 These are one of the tree species of cacti from the Andes. We pulled off the dirt road at the entrance to a ravine. A family were enjoying a barbeque by the flowing stream. We followed a path through lush pampas grass, paddling in and out of the water. Then around us was a vista of tall cardóns. We had seen this species before, though this was a new setting. Among the rocks were well armed Cumulopuntia boliviana, less spiny than ignescens but still good enough to stab our ankles. What were special were the little Opuntia sphaerica and especially the golden spined Oreocereus leucotricha up the steep slopes. Some of the mountain goats among us set off up the hill to look closer, others, (like me), followed Williams to a scenic waterfall. When we looked up the hillside at Oreocereus leucotricha and Echinopsis atacamensis growing side by side both were quite discrete but we were tantalised by the occasional intermediates. Plants branching from the ground with golden spines; possible hybrids midway in height between proud parents? An unlikely scenario, but conceivable. There was unfortunately no time to explore further. Lunch and especially beers were calling. Above: Short Oreocereus leucotrichus with tall Echinopsis atacamensis and possible hybrids. On our return we had a free afternoon. 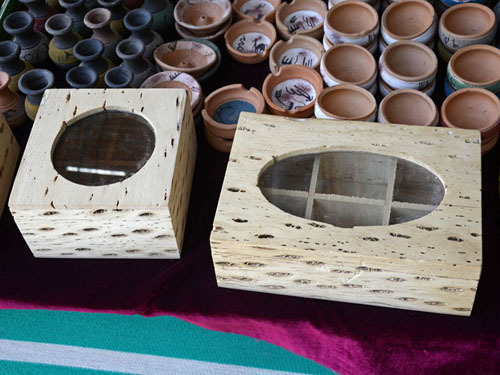 Time to explore the San Pedro markets and buy cactus-wood trinket boxes, souvenirs of our visit to the Tatio Geysers.